Posted: 18 Feb 2014, 08:29, by Victor H.
Samsung has just unveiled the full list of devices that will get updated to Android KitKat, and confirmed that updates start rolling out today. 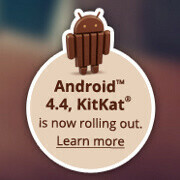 The Korean company will update its smartphones and tablets directly to Android 4.4.2 (skipping 4.4 and 4.4.1), the latest KitKat version that has ironed out the minor issues in the original 4.4 release. All else, however, should not worry as the update will pop up automatically on their devices when it’s ready (chances are this will happen in a few days or even weeks, since the roll-out is gradual). The update happens over the air (OTA), so the only thing that you’d have to do once it’s available is to accept it, and wait for the files to download and install. Also, make sure that your phone battery is full when you start the update. Finally, do keep in mind that some carriers are slower in validating Android updates, and if you own a carrier-branded phone, the update might be slightly delayed. If you have gotten the KitKat update already, do let us know in the comments below and feel free to send us a tip with screenshots as well. GMT+8, 2019-4-19 15:20 , Processed in 0.053534 second(s), 25 queries .